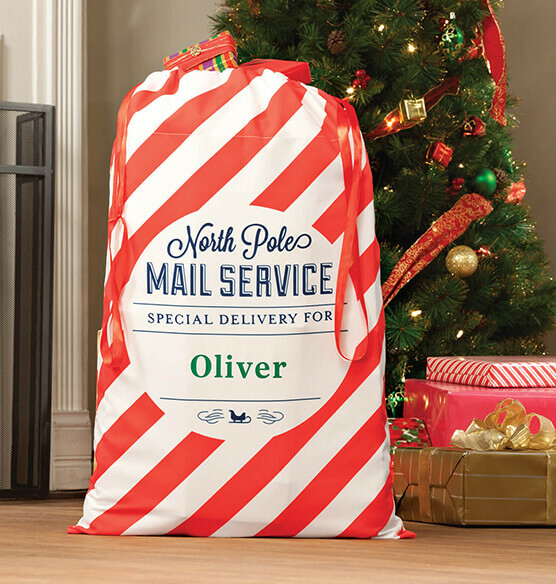 Santa's merry mail bag turns a holiday gift into a special delivery, arriving personalized for one lucky recipient! Featuring candy cane stripes in red and white, the personalized Santa gift sack cinches closed with red satin ribbons and is generously sized for wrapping a large gift or transporting several smaller ones. Stuff it with small and medium-size gift items for a special child on Santa's gift list, or use it to deliver gifts to each member of the family. It's also a clever way to keep away snoopers who may be tempted to shake wrapped gifts, attempting to figure out the contents before it's time to open presents. 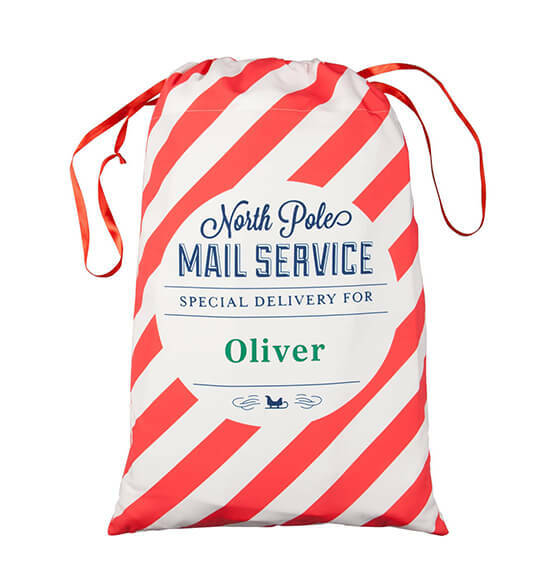 Our Santa sack is pre-printed with "North Pole MAIL SERVICE" and "SPECIAL DELIVERY FOR". We'll add one special name, making Santa's surprises even more fun! Specify name; limit 1 line, 11 letters/spaces. 100% polyester; spot clean. Christmas sack measures 20 3/4" wide x 31" high. Includes convenient carry handles. for anyone. Kids love most anything with their name on it. Huge Santa Gift Sack, PERSONALIZED! When I opened the bag in which these personalized gift bags came it, I was beyond satisfied! Not only are they huge (much bigger than I expected ), they are also beautifully made with attention to detail. They are so big that I can almost completely fit into one, however I'm only 5'0 tall though, lol! Whomever is the recipient of one of these will have a treasure forever!